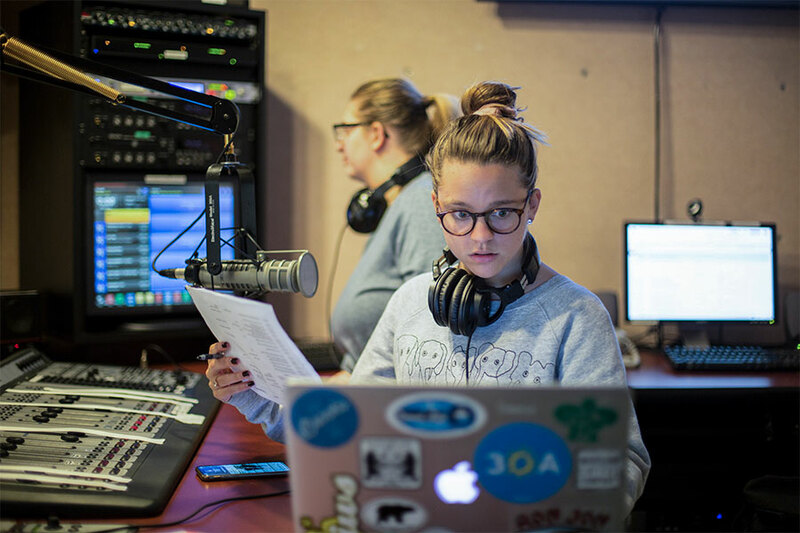 Utilizing Principia Internet Radio studios and computer labs in Merrick-Davis Center as the Prin@thePolls newsroom, students in political science and mass communication classes broadcast real-time results from the U.S. midterm elections last month. Approximately 80 students delivered four continuous hours of coverage—hosting roundtable discussions on key issues, analyzing election returns, engineering the soundboard, and monitoring developing stories. In every national election cycle since 2004, the Political Science and Mass Communication Departments have collaborated in this unique, hands-on project to help students make connections between what they’re learning in the classroom and the real-world political landscape. Though faculty and staff certainly oversee the project, Prin@thePolls is a student-run endeavor from sign on to sign off. During the weeks leading up to election night, students researched particular races, advertised on campus, and recorded radio promos and opinion pieces. Mass communication students also created a video crew to document the event and conducted an official “takeover” of Principia College’s Instagram account, tapping social media’s ever-evolving potential to engage audiences. Since the election, students involved in Prin@thePolls have explored the potential impact of the midterms in class discussion, projects, and presentations on the balance of power in the House and the Senate, the president’s agenda in the second half of his term, political party affiliation, and voter turnout across the country, among other topics.